Human beings are 55-60% water, so make sure yours is the best possible with RefresH2Go! Here at ChiIL Mama we particularly love to feature local & women owned businesses, eco friendly finds, and cool new products that make lives easier. RefresH2Go fits all of the above! 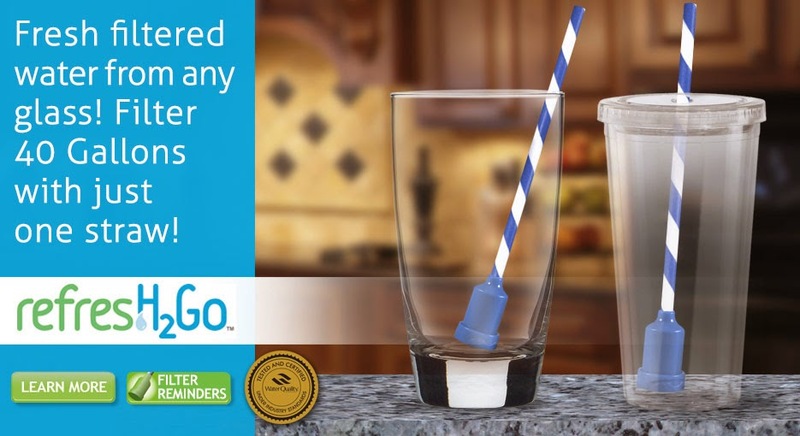 We're elated to be partnering up with them to give away 2 filtering 22oz bottles with straw/filter & Universal Filter Straw 2pack ($22 value) to THREE winners. Disclosure: We're elated to partner up with RefresH2Go. They have given us product for our giveaway and review purposes. As always, all opinions are our own. 2 reusable 22oz water bottles with filter and straws ($7.99 each) and a 2 pack of water filter/straw replacements ($5.99) 3 winners chosen. Total prize value approx $22 each. Open nationwide. Enter through midnight December 17th. Click here for ChiIL Mama's prior RefresH2Go coverage from the Sassy Moms Back to School Soiree. Our family uses reusable bottles daily, but they often have to be refilled on the go, where great tasting, filtered water isn't available. RefresH2Go to the rescue. We've been using these excellent bottles ourselves for several months now and highly recommend them. The RefresH2Go® Brand was established in response to consumers demand for safer, great tasting water anytime, anywhere. Bottled water has been filling this need for years but can be extremely costly to consumers’ wallets and to the environment. 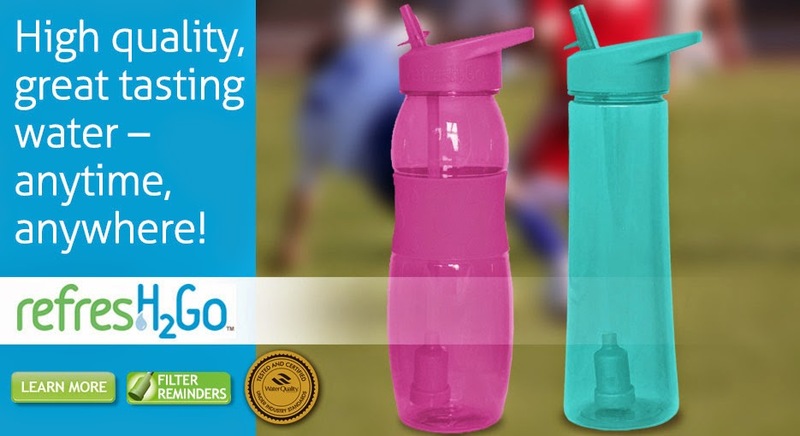 RefresH2Go® is a reusable bottle which filters tap water from any drinking fountain or faucet that filters the water as you drink, resulting in great tasting water anytime, anywhere! 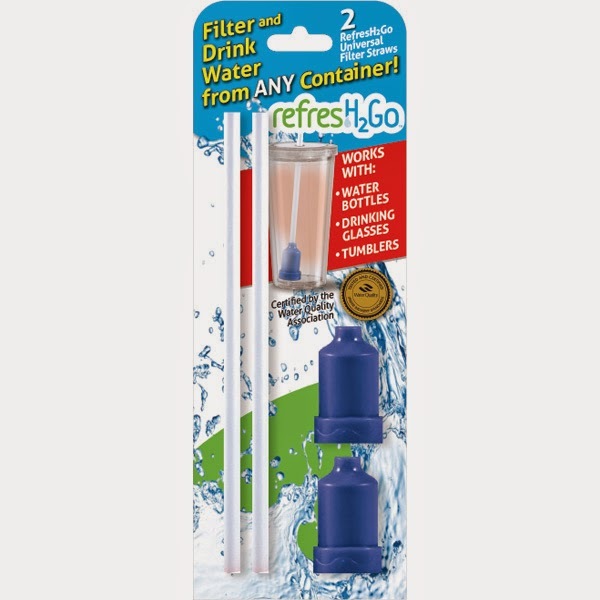 RefresH2Go® is committed to providing consumers with a high quality on the go filtration product at an affordable price. We are a women owned, family company that has more than 12 years of experience in the water filtration business. RefresH2Go® is committed to providing consumers with high quality on-the-go filtration products at an affordable price. All of our products are tested and certified by an independent certification agency, ensuring high quality products for consumers. Our products are tested and certified by the Water Quality Association for materials safety and performance. For more information regarding the Water Quality Association testing and certification, please click here. If your bottle cabinet & kitchen are anything like ours, sometimes it's a daunting task to find just the right lid & straw combo on your rush out the door. These guys have you covered with with flexibility and flair! One RefresH2Go Filter saves up to 300 bottles of water!! Our only criticisms come from my tween and teen and they're certainly not deal breakers. My son isn't crazy about drinking out of the square shape on the flip top. My daughter doesn't like the sweet, coconut taste the filter gives water on the first few fills. It fades fast though. I love coconut water and drink it often, so I don't mind a hint of the flavor when the filters are new. 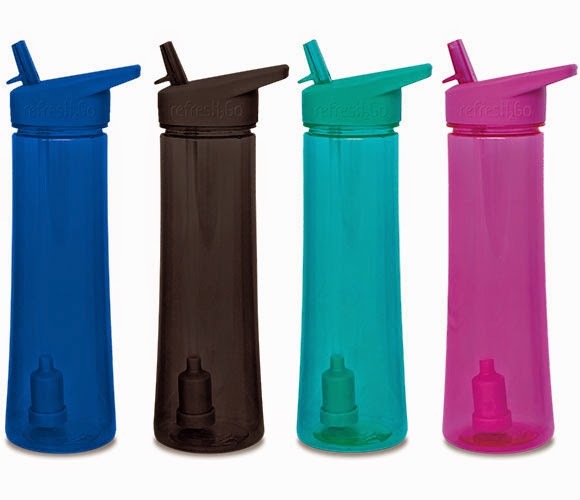 The bottles are affordable, self filtering, easy to clean, easy to flip open, and they don't leak. So that makes them a great go to bottle in my book! Highly recommended for gifting during the holidays and beyond! Then come back to enter early and often the next 12 days, for your chance to win! Please contact us to find a retailer located near you. Disclosure: Once again, we're elated to partner up with RefresH2Go. They have given us product for our giveaway and review purposes. As always, all opinions are our own.